A high-specification project creating flexible work spaces with the install of acoustic moveable walls and bespoke office partitioning. 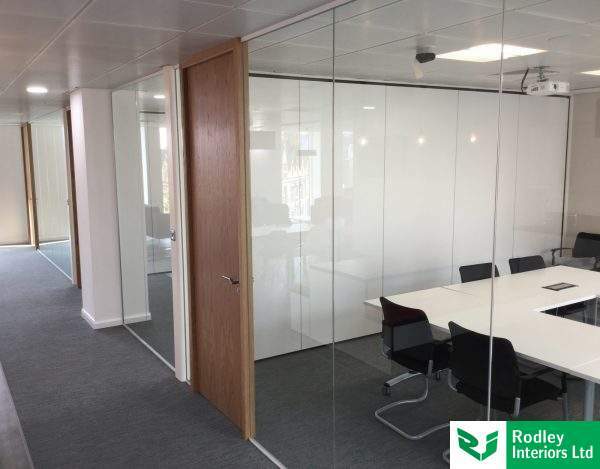 Rodley Interiors were commissioned to undertake a sizeable office partitioning install for a new client within West Yorkshire. The attractive building overlooking the heart of the City Centre offers both a large floor space of 5,770 sq ft with a maximum feel of natural light, making this a model working environment. The brief for the project was to create an adaptable office space with the install of office divisions throughout. 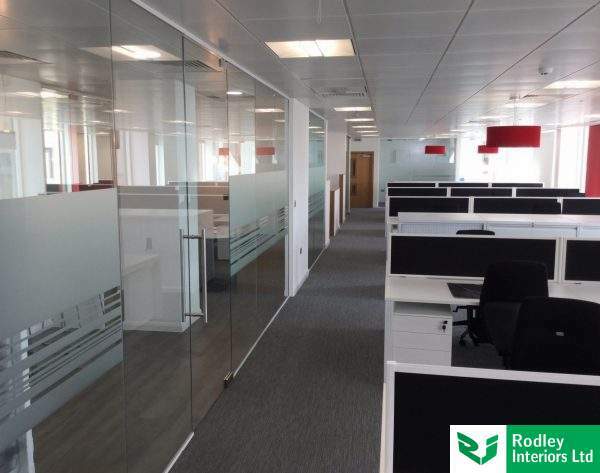 Each office area formed required an individual need therefore by using a variation of materials and partitioning systems we were able to fully comply with the brief set from our client in turn creating an aesthetically pleasing, modern and flexible workplace. 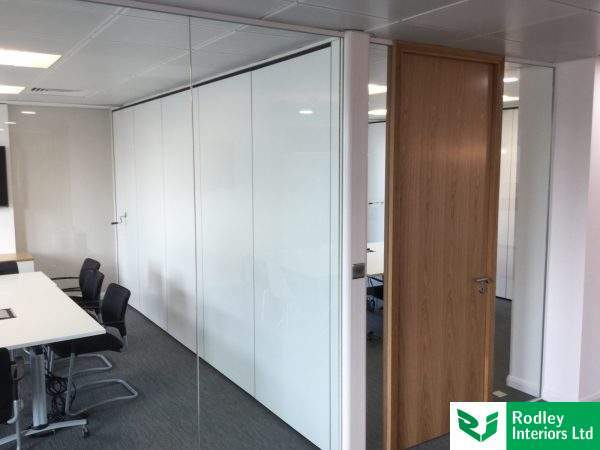 To begin with during the 1st phase of the office division install we discussed using a partitioning system that would work well within this commercial space. To take advantage of the elegant full height external windows and to utilise the extensive floor space we fitted a frameless glass partitioning system. 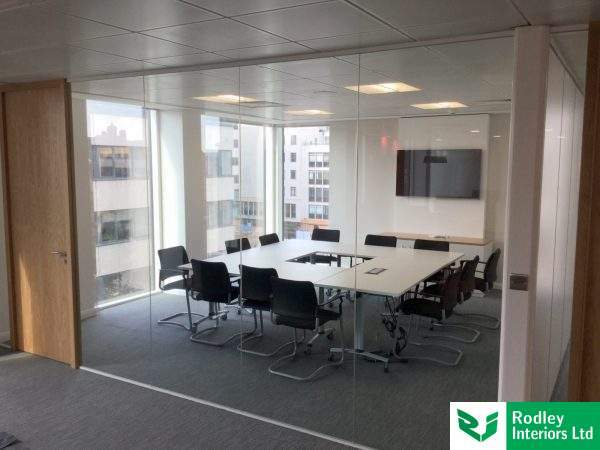 The specialised partitioning forming these appealing meeting room areas was a single glazed toughened system which ran from the floor level to the ceiling level, ensuring a thoroughgoing feel of light. Differentiating this frameless glass install from any other it was fitted in conjunction with full height solid Oak doors with solid Oak door frames. The solid Oak door sets worked seamlessly well with such a modern glazing system, forming a real feature to the end of the office area. 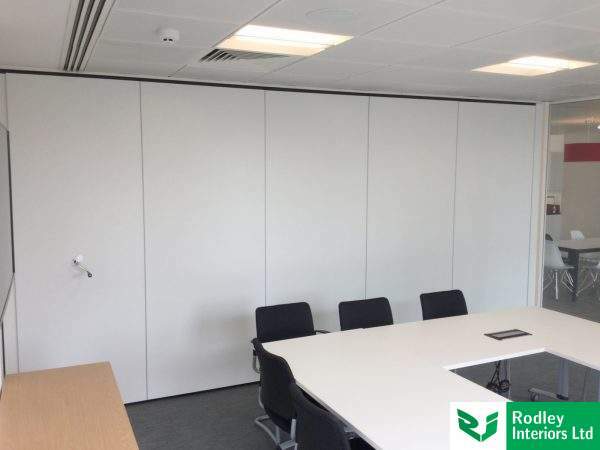 As the meeting room dividing walls required both flexibility and high performance qualities we installed 2 moveable walls. These intelligently engineered office divisions create working spaces that both alter in shape and meet the ever changing needs of a business. The 2 moveable walls enabled 3 individual meeting rooms to be formed with the opportunity to open these up into 2 or 1 large open area, ideal for conferencing and seminars and perfect when creating and adaptable office space. These superior quality build divisions were fitted with a single point suspension system and white head channel sat within the metal pan suspended ceiling. The easy use walls with individual panels moves freely into position and locked into space. The acoustic qualities are met by a sound baffle which drops from the bottom of the panel to the floor, this in turn forming a sound barrier. Moveable walls offer beautiful aesthetics with excellent acoustic performance qualities. The walls offered a fresh and modern feel. The floor to ceiling height walls in White complemented the clean and sharps lines of the rest of the install. Created a bold, bright and inspiring place to work. The moveable walls had a soundproof rating of 48Db Rw to offer maximum sound reduction. The easy-slide back system allows the walls to be folded back with ease. In continuation with the specialised frameless glass install we fitted a multitude of glazed office fronts, built within formed openings. The glazed walls maintained the theme of creating and adaptable office space with the glazed windows fitting in perfectly with the style of the modern building. The fluid transition from glass to solid and the excellent adhesion between the glazing and its joints entailed in a certainly and eye-catching and striking place to work. 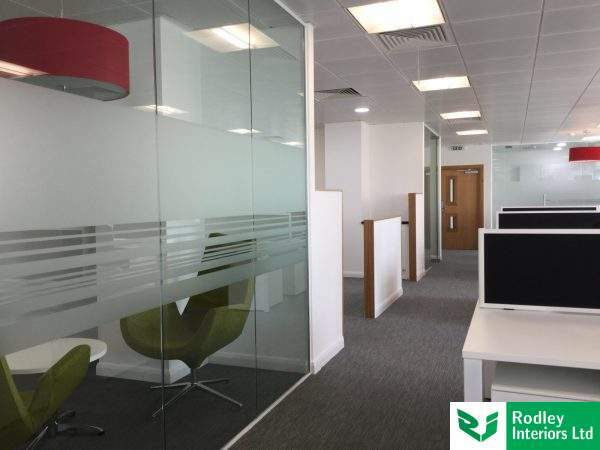 The frameless glass is quick and efficient to install and offers clear aesthetic benefits to any office area. 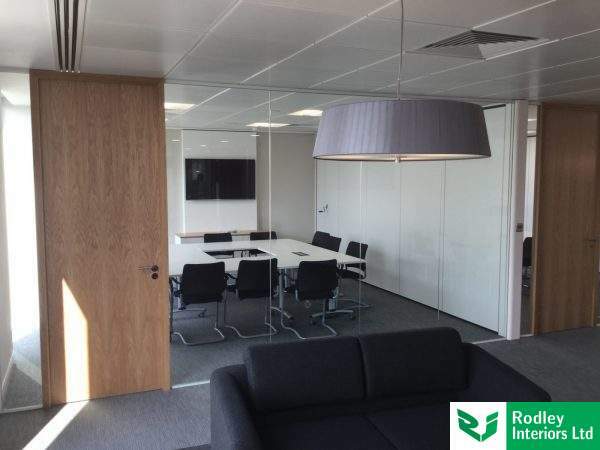 To enable unhindered vision whilst still maintaining an element of privacy in each of the individual offices, manifestation banding was applied by a specialist contractor.